With just a few days left until Christmas, it’s time for us to kick off our annual look back at the best beers of the year just gone. As in previous years, we’re focusing solely on new beers released for the first time in the past 12 months, although this can include new versions or vintages of previous beers. This time around, we’ve also cast the net a little wider in terms of opinions. We asked our contributors in each state to get together with experts from their local beer industry and hammer out an agreed "best of" over a few beers. How they presented their results – in an ordered top 10 or simply 10 great beers, whether they limited entries to one beer per brewer or not – was left up to the individual panels. Over the coming fortnight, we’ll present their results, starting today with the top 10 from Tasmania, put together by a team based around Lonny’s Saint John Craft Beer. The lists should prove useful reminders for those of you keen to vote in the GABS Hottest 100 Aussie Craft Beers poll, for which voting opened on Monday. To say that we were chuffed to be asked by The Crafty Pint to compile the top 10 Tasmanian beers of 2015 would be an understatement. It was a pleasure to sit down in good company and recall some of the top brews we had encountered in what was a massive year for the Tasmanian craft beer industry. 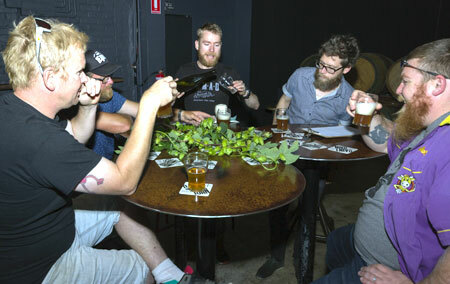 The Tasmanian Beer Trail was launched, handfuls of new brewers busted onto the Tasmanian scene, Hop Products Australia, which is based in the state, announced plans to expand production by 50 percent, new strains of unique Tasmanian barley were trademarked and many new beers graced the taps at Saint John and elsewhere. But which of these were the best of the best? Emails were sent and phone calls were made and we quickly compiled a panel of five beer tragics to decide the fate of the 10. On the panel were an avid home brewer who had brewed with Seven Sheds for the past 12 months, an English expat who is a regular at Saint John and is also handy with a lens, and three crafty bartenders. 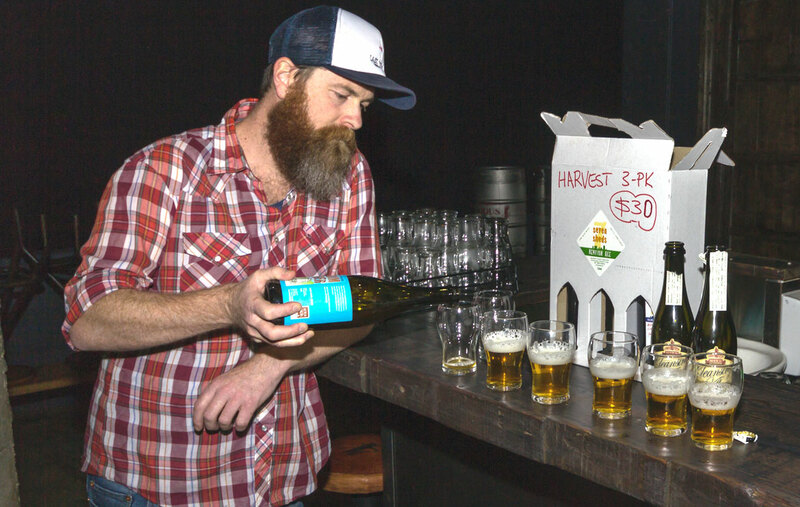 The craft beer exposure among the group was vast and we felt that between us we could make a fair and just list of the best new beers of Tasmania for 2015. We all sat down on a Saturday afternoon in the Barrel Room at Saint John and sipped through the samples that were given to us by brewers who had released new offerings in 2015. It soon became apparent, however, that a lot of the shortlisted beers were very “limited release, one time only beers” and that we would have to rely on recall for those that made the top end. Also, one of the lads pointed out that a few brewers popped up more than once in the short lists and, collectively, the group decided that even if one brewer was to take out the top five it would be a case of “credit will be given where credit is due” and that the final decision would be based on the quality of the beer alone. With the selection process decided, we bundled together a list of the top 10 brews. Then we would score our beers in order giving 10 points to the best beer, nine to the second and so on. A tally would be compiled at the end and the beer with the highest score would take out the number one spot. And here are those results, from last to first. Lightly hopped wheat ale. Uncomplicated, light and quaffable. Worthy of the top 10. The only release form HBC in 2015 but an absolute cracker. All the flavour with deep chocolate and a small hint of rye spice. Drinks like a 7 percent ABV porter. Keep an eye out for big things from HBC in 2016. Spiced Imperial Stout. Released for GABS 2015. What hasn’t this beer got? Barrel aged and spiced with unique Tasmanian ingredients. We all like a beer that lives up to its namesake and this is just one of those. A solid IPA displaying reserved hop character with, yes, pineapple and citrus aroma and flavour with a slightly sweet finish. Thumbs up. Brewed for the Saint John hop harvest festival of 2015 using an experimental HPA variety only known as HPA-035. This beer was a standout. A fresh ripe berry hop profile backed up by generous amber malts. Pray that this beer gets brewed again. Hybrid between an IPA and Saison. A re-jigged version of the 2014 GABS offering. Loads more hops in this version. A unanimous decision was made by the panel that this is the only real successful hybrid beer to come out of Tasmania. Hops and saison yeast esters combine to create an ode to the brewing genius of Paul Morrison. Brewed in a one-time 20L small batch to be poured through the hand pump as real ale. Malty and complex with a bitterness that is accentuated by the process of the hand pump. Another winner. This is the first barley wine style beer brewed by Will Tatchell and it’s a darn fine first attempt. Flavours of Christmas cake and oaky spice are cut by that warming, boozy ABV. Again, the panel voted this beer as sensational but one that would cellar and produce outstanding results if you have the patience. 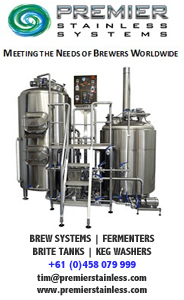 It’s clear that Van Dieman brewing continues to evolve in the changing landscape of craft beer. 2. kick|snare Brewing Stompbox IPA. 6 percent ABV. This beer was launched along with the kick|snare brand at the Esk Beerfest earlier this year. All reports received called this beer for the best IPA to be brewed in Tasmania EVER! This was a big call but whisperings were overheard throughout the festival and indeed people’s lips were abuzz with the zing of Stompbox IPA. Packed full of American and Tasmanian hops, with an intoxicating citrus aroma and flavour, this first batch of Stompbox IPA achieved legendary local status. kick|snare brewing has sinced moved premises and set down roots in Invermay, Launceston… Will the Stompbox legend live on? Only time will tell. As for now it deserves its place at number two. 1. MOO Brew – Harvest Rye IPA. 7 percent ABV. This is the second Harvest Rye IPA produced by Dave Macgill at Moo Brew in successive years and it’s just as good if not better than the previous vintage. Fresh, juicy, moreish are just a few words that come to mind and dare I say it …. balance… Yes, that’s what this beer is. Everything coming together (fresh wet hops and dry yet spicy malt body finishing out with a medium bitterness) to balance the perfect IPA. Two years running this IPA has made top dog, and this year it ran away with the points from the panel. It’s clear that 2015 was a great year for craft beer Australia wide, but 2016 has my fingers quivering over the keyboard in anticipation of more new beer. 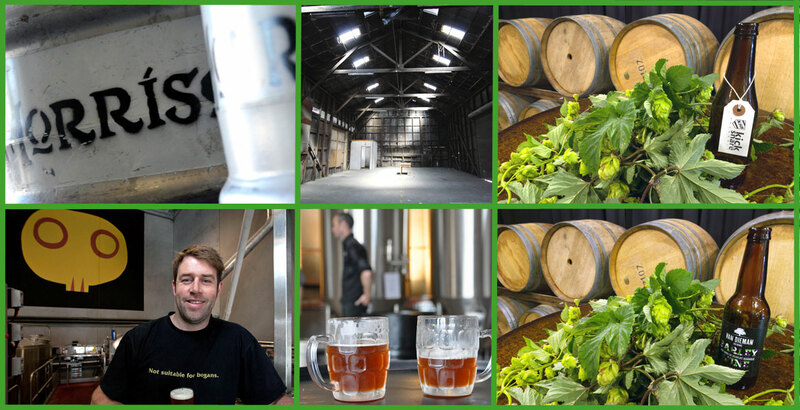 With a handful of brewers launching in the new year in Tasmania, it’s going to be a big one. And, with seven out of our top 10 Tasmanian beers being limited, one time only releases, there’s only one surefire way to get into these unique southern brews… Get on down to Tassie! Thanks all for putting the list together. An impressive showing for Paul Morrison, in particular. Of the beers from Tasmania tasted at Crafty Towers this year and not mentioned above, we’d make special mention of Seven Sheds’ deliciously creamy PilGrim Pilsner, brewed with Cape Grim water, and A Farmer’s Resilience & The Seven Year Itch, the seven-year-old Cleansing Ale from Two Metre Tall, while we enjoyed Captain Bligh’s Lark barrel-aged Wee Heavy when last in Hobart too. But what of you? Did any Tasmanian brews not on this list wow you in 2015?